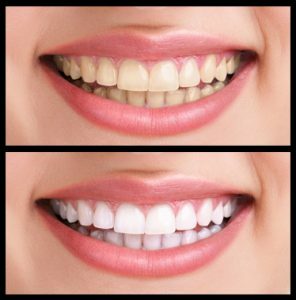 Dental bleaching or Tooth whitening is a highly effective way of lightening the natural colour of teeth without removing any of the tooth surfaces. It cannot make a complete colour change; but it will lighten the existing shade. It is not advisable to whiten teeth for children below 18 years and for women during pregnancy or nursing. When to do dental bleaching/ tooth whitening? Teeth Whitening: Teeth are often stained from smoking, food, drink (coffee, tea or red wine) or poor oral hygiene. Also years of chewing Tobacco or gutka can also result in stained teeth. Bleaching the teeth can remove these stains and enhance the appearance of your smile. What are the types of dental bleaching? Professional teeth whitening (in-office whitening) is the most common form of tooth whitening. Using laser teeth whitening can produce dramatic instant results by using highly intensified light to activate the bleaching process. The procedure takes approximately one hour in-Center. Special plastic foam-lined trays are made in the laboratory accurately fitting your own teeth. A Carbamide Peroxide bleaching gel is issued for self at-home application at a frequency of one hour per day, or overnight, for 14 days, or twice the frequency over 7 days. This should be done under dentist supervision. Teeth whitening will last for upto 12-24 months depending on the lifestyle and the type of teeth. For some people, drinking lots of coffee and red wine can cause the teeth to get darker. A combination of good dental care including brushing and flossing and regular visits to the dentist will increase the length of time that whitening can last. A top up treatment can make the teeth look beautiful. Some people experience some kind of sensitivity either during and/or after the initial treatment. This is usually described by patients as sporadic, sharp shooting pains coming from their teeth. This should settle down after approximately 48 hours though. Usually 1-2 sitting each lasting 30 minutes is required.